When reading about digital marketing, you often bump into this word ‘guru’. Digital guru, marketing guru, online marketing guru – these terms are bandied around quite commonly and are used to describe people who seem to know the ins and outs of digital marketing. Much like the Indian gurus (spiritual leaders), they hold the secrets that unlock online success, and they’re willing to share them with you – for a price, of course. Enigmatic as these marketing gurus might sound, in my experience, there’s very little that is mysterious about digital marketing. I transitioned to online marketing about two decades ago, and I’ve come to realize that like everything else, it’s about practice and application, and, above all, constant learning. But, I warn you – it’s not as easy as it sounds. Digital marketing is a dynamic world, and it has a habit of changing overnight. One new social media platform can reshape the marketing scene, one trend can ‘break the Internet’ as the saying goes, and one update can affect your website’s ranking and push it to the back of beyond pages of search engine rankings. Learning is key. So is keeping yourself constantly updated about the developments happening within the industry. 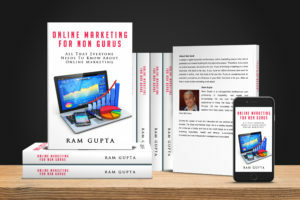 And that’s why, in the spirit of sharing the knowledge I have gathered in these years, I’ve put together articles on digital marketing and compiled them into a book. Don’t get me wrong, I am not claiming to know it all, but I am saying that I have learned a lot. It’s only through sheer hard work and perseverance that I have managed to overcome my initial hesitation towards technology and harness its potential for my benefit. I wish to extend the same advantage to you and hope that you’ll find this book a valuable addition to your library, and your online marketing efforts.